It's awesome to know that someone like Ty McBride (who used to work for Jeffrey Campbell) will come all his way to Manila just for a lookbook shoot. We've been chatting for months to plan this whole thing and it's super fun that it materialized . He came here on the 24th of December (so sad right but work is work). The day before the shoot we went to Greenbelt for lunch then we headed to Chinatown and Intramuros for a quickie tour. He bought a Rayban knock offs and ate Sisig at a Filipino restaurant. During the meeting Ally and I brought samples of our latest shoes so he could see them personally. We were very happy that he loves every bit of them. He said that Gold Dot is the only Philippine-label that is at par with the int'l ones. whew! My lack of sleep really challenged me to create meaningful sentences in English but good thing Ty wasn't too much biggie about it. He's so cute and funny! He shared a lot of interesting stories about his co-workers in Solestruck, shoes, bloggers, etc.. and how most of the shoe labels in the US are owned by straight guys.. mm hmm girl! Ally werqing the Balsey wedges..
Ty buying shades. good thing Ally was smart enough to haggle.. P3000 for a rip off ray ban, woman you're nasty! great pics!! 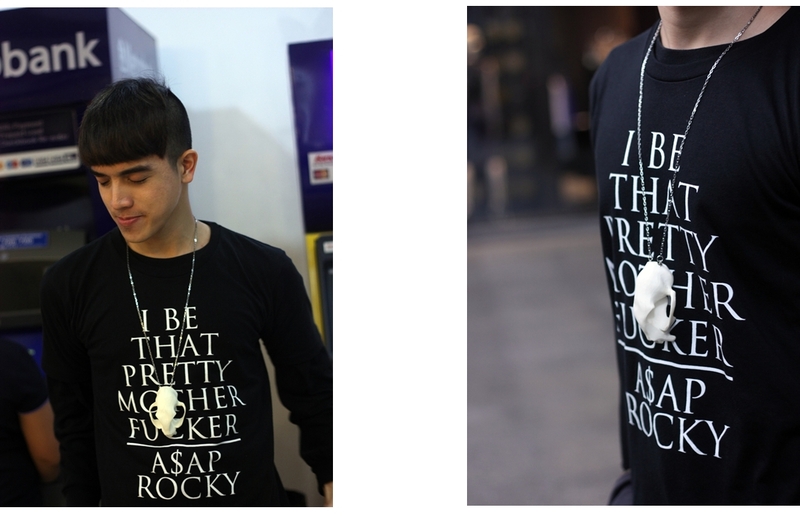 is that an OS necklace with the A$AP ROCKY shirt?